Plasencia is a market town in the province of Caceres, situated along the Jerte River that runs through the western region of Extremadura. It was founded in 1186 by King Alfonso VIII and only ten years later it was invaded by the Arabs. However, one year later King Alfonso re-captured it and over the centuries, because of its strategic location along the Silver Route, many noblemen chose to settle here. Consequently it has been left with a very beautiful historic quarter. During the 12th century a double line of walls was built around the old quarter with six gates and no less than 68 towers. In the centre of town is the Plaza Mayor which has always been the heart of Plasencia. It is here where you will find the Renaissance Town Hall and where one of their most popular festivals, the Martes Mayor, is held in August. Just off the Plaza Mayor on Calle del Rey is the La Casa de Las Argollas. This was the wedding venue for the 13 year old Princess Joan la Betraneja. If you are particularly interested in ecclesiastical architecture there are also several fine examples of 13th century churches such as the San Nicholas, San Martin, San Slavador and San Pedro. There is also the church and convent of Santo Domingo, and the Church of San Esteban which were both built during the 15th century. Wandering the medieval streets of the old quarter is definitely the best place to start from whilst exploring Plasencia. 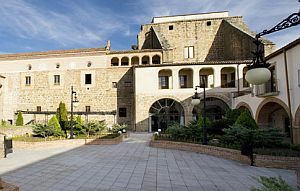 But it is also a marvellous place to base yourself especially if you are looking for luxury accommodation for this is where you will find the Parador Hotel Plasencia. Once a 15th century convent, the hotel has a seasonal swimming pool and its own restaurant which is considered to be one of the best in the province for local cuisine. One of Plasencia's most prestigious buildings is the Cathedral which is made up of two parts. The original part follows the floor plan of a Romanesque style church although built in the 13th century. The Romanesque style first reached the north of Spain in the 10th century but it was not implemented in this area until much later. All that remains of the original features are the naves, western facade, and chapter room. The newer part, although hardly new as it was added in the 15th century, was built in a Gothic style with high vaults supported by columns. The main chapel has a 17th century altarpiece created by Gregorio Fernandez, one of the great Spanish masters of that era. If you wish to see the works of earlier Spanish artists there is a museum inside the older part of the Cathedral. The town's prominence during the Middle Ages is very much reflected by the many palaces that were erected. Some of the more impressive are the Palace of Monroy, the Episcopal Palace which is near the Cathedral, the Palace of Carvajal-Giron, and the Palace of the Marquis of Mirabel. To learn more about the traditional culture of this region the Perez Enciso Ethnographic and Textile Museum is well worth a visit as well. Located in what was once the Santa Maria hospital, there are some fascinating exhibits of wood carvings, ceramics, pottery, and various tools used to produce linen and wool centuries ago. If you have a car at your disposal you certainly have a choice of interesting day trips. Begin with a drive through the valleys of Ambroz or Jerte which are simply stunning in early spring as this is when the cherry trees are in blossom. Or you may wish to pamper yourself at the health resorts of Valdecaballeros. Not far from Plasencia are the historical cities of Caceres and Trujillo, and the 15th century Monastery of San Jeronimo of Yuste where Emperor Charles V died. But for those who love the outdoors there is also the Monfrague National Park which is 17,000 hectares of protected area and home to a variety of spectacular birds of prey, the rare Iberian Lynx, and wild boar.